It’s Monday, which means it’s interview day on the podcast! 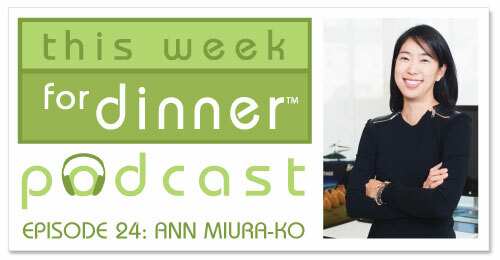 Today I talk with Ann Miura-Ko. Ann is co-founder of Floodgate, a venture capital firm in Silicon Valley that backs digital companies before traditional VCs are ready to invest. Essentially they’re really good at figuring out what the next big thing is. Ann has been called “the most powerful woman in startups” by Forbes and is a lecturer in entrepreneurship at Stanford. You can read more about Ann here and follower her on Twitter here. I asked Ann to be on the show because I knew she would be fascinating to talk to, funny and have great things to share related to food. Ann delivers on all counts and I love this episode. Enjoy! And…pictures of Ann with sumo wrestlers making mochi. She wins.